Downloading and trying new app on your iPhone SE is one of the more interesting and helpful things that can be done on the device. Whether you are trying to improve your productivity, or you are looking for a fun game to play to pass the time, then App Store is a great place to look. Since many of the apps are free, it’s pretty easy to download a bunch of different apps to test them out. Some will be useful and you will continue to use them for years, while others might not be what you had been hoping, or what you had been looking for. Fortunately you are able to delete these apps from your iPhone SE by following our guide below. The steps in this article were performed on an iPhone SE, in iOS 10.3.2. These same steps will work on most other iPhone using most other versions of iOS. Note that uninstalling an app in this manner will also delete any of that app’s data that is also stored on the device. 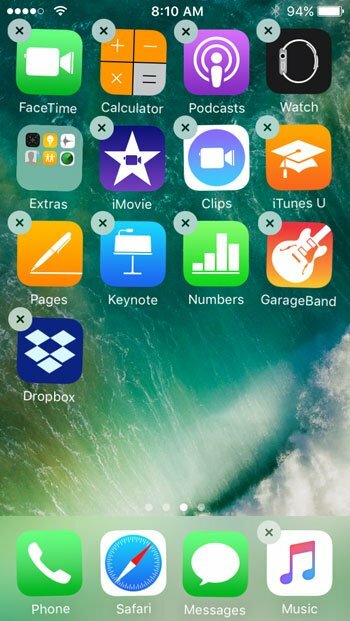 You can delete many of the default apps if you have iOS 10 or higher. Most apps that are deleted can be re-downloaded from the App Store later, if you decide that you need the app in the future. Step 1: Locate the app that you want to delete. 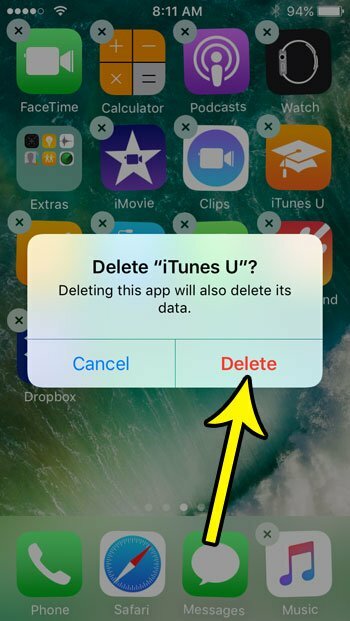 I am going to delete the iTunes U app in the picture below. Step 2: Tap and hold on the app until it starts to shake. Step 3: Tap the small x at the top-left of the app icon. Step 4: Select the Delete button to confirm that you wish to delete the app and its data from your iPhone SE. Deleting apps from your iPhone is a great way to free up some storage space. Read this article for additional things that you can do on your device that can help you get more room, too.